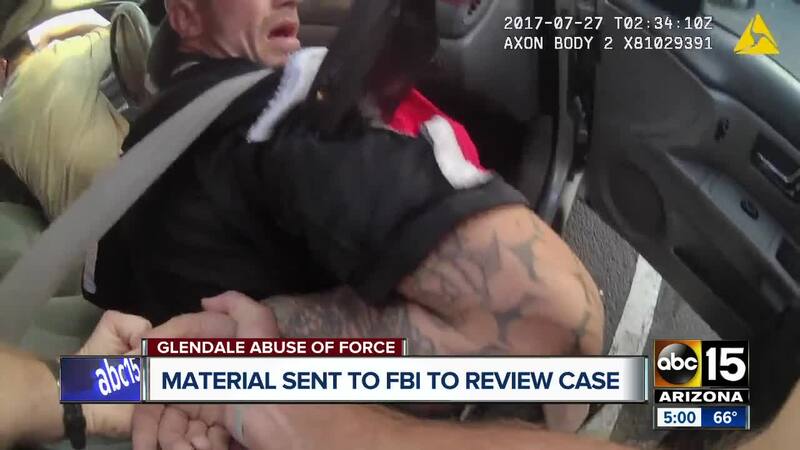 Material has been sent to the FBI to review the Glendale police tasing incident ABC15 uncovered. The City of Glendale has released a lengthy statement that sheds light on their side of an incident involving a man that was tased 11 times during an arrest back in 2017 . The City of Glendale released the statement Wednesday evening, saying that they’ve been in contact with the FBI prior to Governor Ducey’s push to reopen the case . The city says within days of the initial incident it forwarded the case to the Maricopa County Attorney’s Office for review. The city says it had no bias to believe the MCAO investigation was not thorough and comprehensive, therefore they accepted the findings. “For example, not all of the videos show that one of our police officers was assaulted and knocked unconscious by one of the plaintiffs that pled guilty to aggravated assault. It was announced on Wednesday by the MCAO that the case has now been sent to the FBI for potential review . In a statement, an FBI spokesperson said the agency is responsible for investigating potential violations of federal civil rights statutes. "Any time civil rights violations are brought to the attention of the FBI, the FBI collects all available facts and evidence and will ensure they are reviewed in a fair, thorough, and impartial manner," according to spokesperson Jill McCabe. Citing department policy, McCabe said the FBI cannot confirm particular investigations or comment on cases where criminal charges have not been filed. GLENDALE, Ariz. – This past Monday, prior to the Governor’s comments, the City of Glendale was in communication with the FBI and preparing to send all the documents and videos associated with the July 2017 Wheatcroft incident. In addition, on Tuesday, the City of Glendale committed to fully cooperating with the Maricopa County Attorney’s Office decision to re-examine the incident. Within days of the incident, the City forwarded the case to the Maricopa County Attorney’s Office for official review. Glendale’s only role in that investigation was providing all the evidence for their independent review. They notified the City that after their extensive examination, they were declining to pursue criminal prosecution against any of the officers involved. We have no basis to believe that the County Attorney’s original investigation was not thorough and comprehensive, and we accepted their findings. In December 2018, prior to the plaintiff shopping their story to the media, they offered to settle with the City for the absurd amount of $15 million. Glendale’s fiduciary responsibility to the tax payers of Glendale has limited our ability to engage on the specifics of this incident and we are unwilling to litigate it in the media. This case will ultimately be decided on all the facts including a comprehensive analysis of all the evidence. For example, not all of the videos show that one of our police officers was assaulted and knocked unconscious by one of the plaintiffs that pled guilty to aggravated assault. The citizens of Glendale know that the City of Glendale holds our Police Department and its officers to the highest standards, and we are proud to have some of the most well trained and dedicated men and women in the law enforcement serving our community. We will fully cooperate with any additional investigations into this incident.